How cheap can solar get? Very cheap indeed. What’s the future price of solar? I’ll attempt to make some projections (tentatively) here. If current rates of improvement hold, solar will be incredibly cheap by the time it’s a substantial fraction of the world’s electricity supply. But module prices now make up less than half of the price of complete solar deployments at the utility scale. The bulk of the price of solar is so-called “soft costs” – the DC->AC inverter, the labor to install the panels, the glass and aluminum used to cover and prop them up, the interconnection to the grid, etc.. Solar module costs are now just one component in a more important question: What’s the trend in cost reduction of solar electricity? And what does that predict for the future? Let’s look at some data. 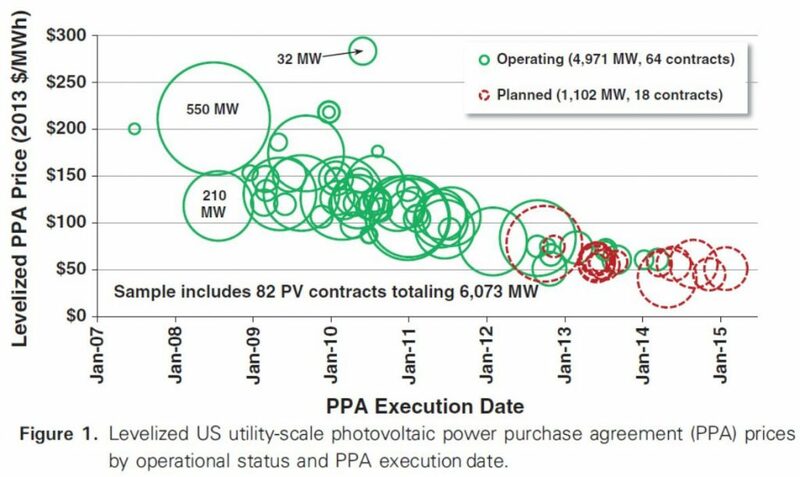 Here are cost of solar Power Purchase Agreements (PPAs) signed in the US over the last several years. PPAs are contracts to sell electricity, in this case from solar photovoltaic plants, at a pre-determined price. Most utility-scale solar installations happen with a PPA. In the US, the price embedded in solar PPAs has dropped over the last 7-8 years from around $200 / MWh (or 20 cents / kwh) to a low of around $40 / MWh (or 4 cents per kwh). The chart and data are from an excellent Lawrence Berkeley National Labs study, Is $50/MWh Solar for Real? Falling Project Prices and Rising Capacity Factors Drive Utility-Scale PV Toward Economic Competitiveness. This is a ~16% learning rate, meaning that every doubling of utility-scale solar capacity in the US leads to a roughly 16% reduction in the cost of electricity from new solar installations. If anything, the rate in recent years appears to be faster than 16%, but we’ll use 16% as an estimate of the long term rate. 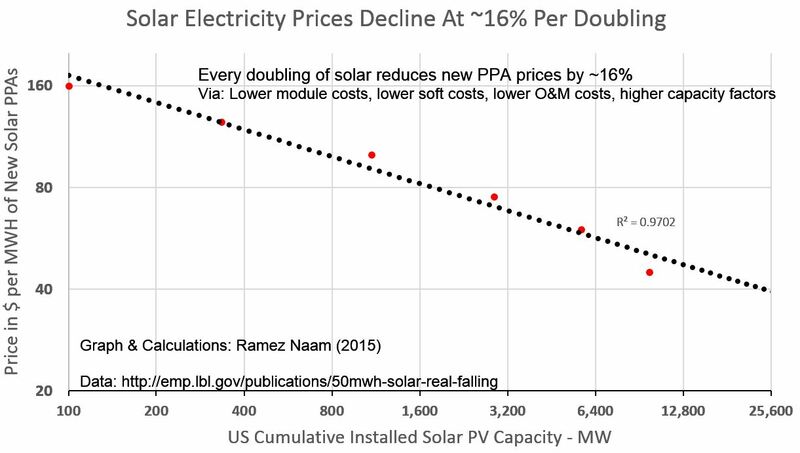 This phenomenon of lower prices as an industry scales is hardly unique to solar. 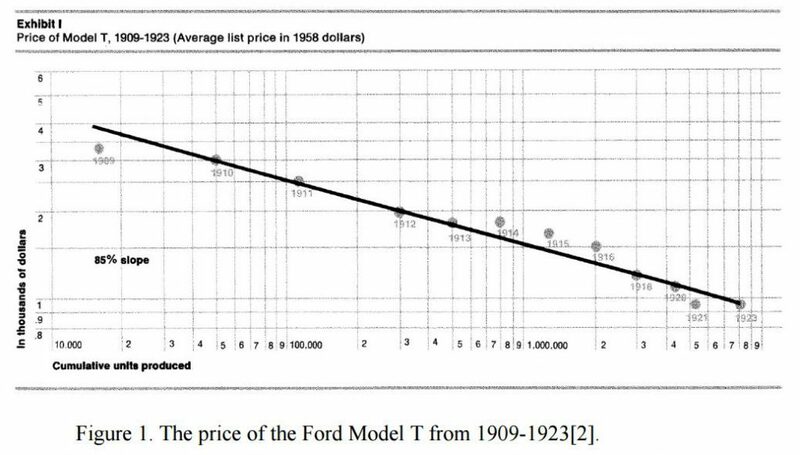 For instance, here’s a view of the price of the Ford Model T as production scaled. Like solar electricity (and a host of other products and activities), the Model T shows a steady decline in price (on a log scale) as manufacturing increased (also on a log scale). 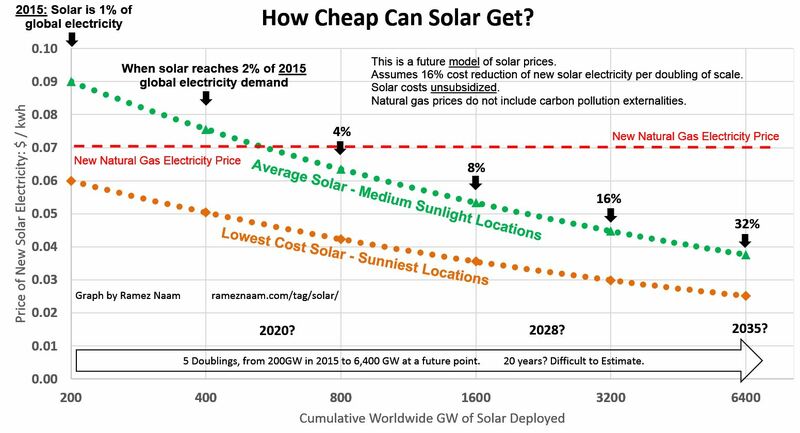 The most important, question, for solar, is what will future prices be? Any projection here has to be seen as just that – a projection. Not reality. History is filled with trends that reached their natural limits and stalled. Learning rates are a crude way to model the complexities involved in lowering costs. Things could deviate substantially from this trendline. That said, if the trend in solar pricing holds, here’s what it shows for future solar prices, without subsidies, as a function of scale. Again, these are unsubsidized prices, ranging from solar in extremely sunny areas (the gold line) to solar in more typical locations in the US, China, India, and Southern Europe (the green line). What this graph shows is that, if solar electricity continues its current learning rate, by the time solar capacity triples to 600GW (by 2020 or 2021, as a rough estimate), we should see unsubsidized solar prices of roughly 4.5 c / kwh for very sunny places (the US southwest, the Middle East, Australia, parts of India, parts of Latin America), ranging up to 6.5 c / kwh for more moderately sunny areas (almost all of India, large swaths of the US and China, southern and central Europe, almost all of Latin America). And beyond that, by the time solar scale has doubled 4 more times, to the equivalent of 16% of today’s electricity demand (and somewhat less of future demand), we should see solar at 3 cents per kwh in the sunniest areas, and 4.5 cents per kwh in moderately sunny areas. If this holds, solar will cost less than half what new coal or natural gas electricity cost, even without factoring in the cost of air pollution and carbon pollution emitted by fossil fuel power plants. As crazy as this projection sounds, it’s not unique. IEA, in one of its scenarios, projects 4 cent per kwh solar by mid century. Fraunhofer ISE goes farther, predicting solar as cheap as 2 euro cents per kwh in the sunniest parts of Europe by 2050. Obviously, quite a bit can happen between now and then. But the meta-observation is this: Electricity cost is now coupled to the ever-decreasing price of technology. That is profoundly deflationary. It’s profoundly disruptive to other electricity-generating technologies and businesses. And it’s good news for both people and the planet. Is it good enough news? In next few weeks I’ll look at the future prospects of wind, of energy storage, and, finally, at what parts of the decarbonization puzzle are missing. Futurist.com Think Tank Expert... A former Microsoft executive, computer scientist, and award winning author of five books, Ramez has spoken on these topics on national television, before audiences of thousands in the US and abroad, and to executives and dignitaries ranging from Bill Gates to the President of the Dominican Republic.